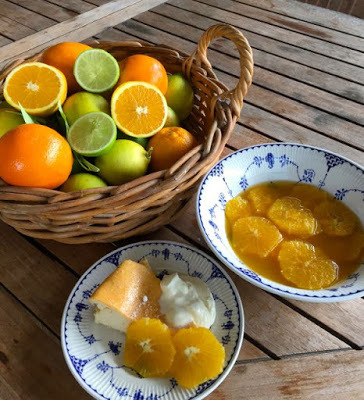 I’ve just picked the first of this year’s crop of sweet and juicy citrus from my garden and am reminded that this is one of the many delights of enjoying seasonal harvests – as the weather cools, a changing variety of foods become available and we can look forward to putting different dishes on the table – less salads and more hearty soups and casseroles – and yummy desserts using citrus. into cooking the turkey roast every year, usually just wearing a sarong with the fridge door open to keep cool, but I long for a cold Christmas when we can enjoy a hot dinner and when the traditional foods are in their proper season. 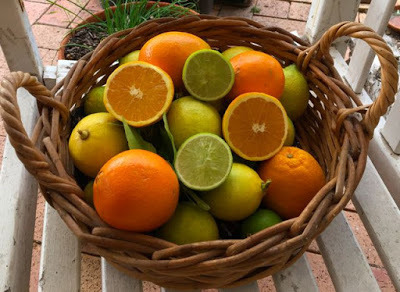 It also occurs to me that is probably not just a coincidence that citrus season accompanies the coughs and colds winter spell – just when we need higher doses of Vitamin C and citrus goodness. These poached oranges are very quick and easy to make and a great way to enjoy their sweet and tangy juiciness. This dish owes its origins to Mediterranean cuisine where laden orange trees drip over old stone walls and line the streets of cities like Athens – and where citrus are served every which way for desert. It’s great to have a standby dish of these in the fridge to have with yoghurt for breakfast; jazzing up a piece of afternoon tea cake or for desert with ice-cream – In their syrup they will keep for over a week. TIP: This is a very refreshing dessert to have after a spicy meal. 1 kilo sweet and juicy navel oranges. It’s important to use navels because they don’t have any pips and stay firm when you slice them. 1. Put juice of oranges and lemon, honey and water in small non-reactive saucepan. Bring to boil and simmer until syrupy and liquid is reduced by about a third. NOTE: Using honey instead of sugar gives a more floral flavour. 2. While the syrup is simmering peel the oranges making sure you remove all the white pith otherwise your finished dish will be bitter. NOTE: I find the best way to peel oranges like this is to get a flat chopping board (not one you use for garlic! 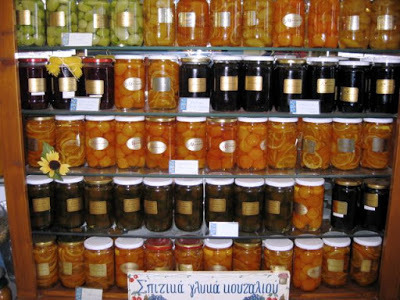 ), take a slice off the top and bottom – you don’t want those bits anyway – so that they stand flat and with a sharp knife slice the peel downwards towards the board. 3. Slice the oranges into thin rounds and place in a glass or ceramic dish. 4. Wait until the syrup is completely cooled then pour over the orange slices through a fine strainer. Refrigerate before serving. Poached Oranges in honey syrup with Ricotta Cheescake and homemade yoghurt.